I suppose people probably have mixed feelings about 21X themeless puzzles- but personally, I love them. 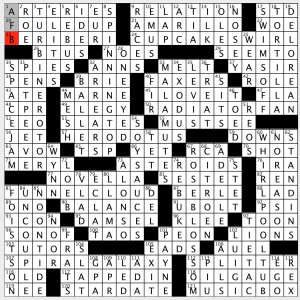 Lots of opportunities to feature entries that otherwise would never see the light of day in a crossword. 23A [Teenagers in love] HIGH SCHOOL SWEETHEARTS. I like the idea of HIGH SCHOOL SWEETHEARTS, but now that I’m teaching high school (after 12 years of middle school), there are very few couples that make me say “Awwww.” One teenaged couple got engaged on the senior trip last month in Disney World. Most of us cringed. 100A [Avoid being a hypocrite] PRACTICE WHAT YOU PREACH. This is where I found my foothold after floundering in the north. Only needed CEWH to figure it out. 58A [2019 superhero film about Carol Danvers] CAPTAIN MARVEL. 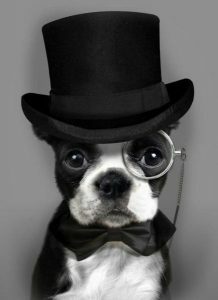 62A [Breed nicknamed the “American Gentleman”] BOSTON TERRIER. 66A [Auto label] BUMPER STICKER. That great triple stack in the middle yielded no dreck (although I was unfamiliar with STENTOR). Nice find! I initially panicked when I scanned the north half of the puzzle and couldn’t find any traction. Finally hit 75D [Contained, with “up”] PENT, and everything was relatively smooth from there. 44D [Drill instructor?] SHOP TEACHER. Really wanted PIANO TEACHER. My dad would’ve liked this clue as a veteran shop teacher. 6D [Nice way of expressing approval?] OOH LA LA. As in Nice, France. You didn’t trick me here for a second, Birnholz! (pats self on back). 12D [Ones shown playing on the Hallmark Channel on Super Bowl Sunday] KITTENS. Way cuter than HIGH SCHOOL SWEETHEARTS imo. 64D [Mini machine?] ENGINE. As in the Mini Cooper. Seems like car related entries lend themselves to clever cluing. 67D [Maker of Preludes and Concertos] HONDA. See note above. 5A [Creatures featured in “Best in Show”] DOGS. Great movie reference. 9A [Form of poetry / Presented as in this clue / But not the others] HAIKU. Love it. 51A [What Edward Nygma poses to Batman] RIDDLE. I wrote THREAT. I don’t think I ever knew the Riddler’s real name… but it’s definitely an aptonym. 54D [“I’m with you”] DITTO. Very difficult for me to erase ME TOO as there is some letter crossover with the correct answer and it seems so right. 76D [View from Chamonix] ALPS. I wanted the last letter to be an E, as in a singular Alp in French. 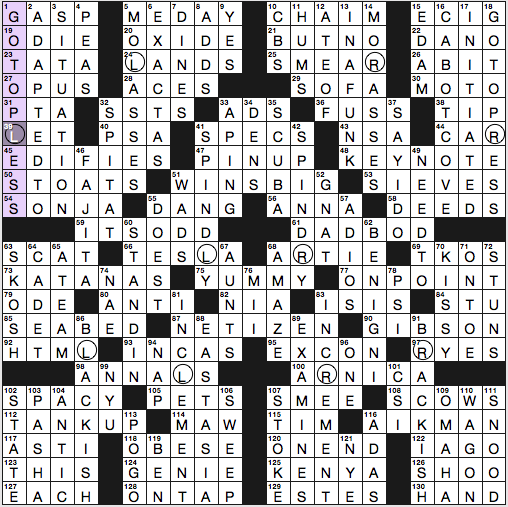 Last letter I filled in was the S.
Grid is practically void of Crosswordese- quite the feat for 21x fill. I would’ve preferred a few more longer entries, but it was a satisfying solve with the right amount of bite. 3D [Publisher of the game “Space Harrier”] SEGA. 102D [Console for playing “The Legend of Zelda: Skyward Sword”] WII. 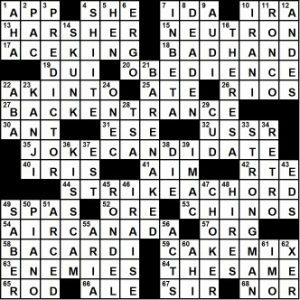 Today’s smaller Sunday Universal puzzle features Jake Halperin’s stirring up cake in a grid that includes four horizontal and two vertical non-theme answers that are of equal or greater length than the shortest theme answer–and all theme answers are horizontal! I might have advised the use of starred clues to avoid potential confusion in theme identification. Read on. I was taught that, with the exception of an entry in the grid’s center, the shortest horizontal theme answer should always be longer than the longest horizontal non-theme answer. There was a corollary to the effect that it was permissible, though not recommended, that one pair of vertical answers could be of equal length to the shortest horizontal theme answer–if there were no vertical theme answers. If there were vertical theme answers, the corollary did not apply. 17a [Desirable hold ’em holding] ACE KING. Your mileage may vary, but when the very next entry was 18a [Undesirable hold ’em holding] BAD HAND, I paused and studied these two as a potential blast-off to a dynamite card-game theme. Though, I could not figure how a rack would figure into this. Alas, ’twas but a mini-theme of 7-letter proportions. Then there was 20a [Kind of school for dogs] OBEDIENCE, which I paused to consider as the possible kick-off to a theme that had not yet begun to materialize–I mean, 9 letters is usually in theme territory. But no! 27a [Where a delivery person might come in] BACK ENTRANCE. Easy answer, but the scrambled letters of cake spanning the 2-word ILSA here eluded my eye, since their only prior appearance was in a 7-letter answer whose purpose as a mini-theme element seemed to have been accomplished. 35a [Election participant who’s in it for laughs] JOKE CANDIDATE. As soon as I saw this one, I called, “Green paint alert!” and looked it up. Searching for this answer in onelook.com took me only to a Wiki site titled “List of frivolous political parties.” Googling it produced a respectable number of hits, but glancing through those told me that these are just two words that come together when someone like Stephen Colbert or Pat Paulsen runs for President (my favorite joke candidate was Gracie Allen, who announced that she was running for President on the Surprise Party ticket in 1940). But the green-paint doctrine does not necessarily knock out theme answers; they get more leeway than non-themers, and if a few dozen headline writers have used joke candidate, it’s fair game as a themer. And there are the letters–C, A, K, and E–mixed and spanning the two-word phrase, oblivious to its etymology or lack thereof, … and I missed them! 44a [Resonate (with)] STRIKE A CHORD. Now here’s a good ILSA, and there are those letters again, spanning the phrase. And again they escaped my notice, possibly because I see the next 9-letter item looming: 54a [Montreal-based carrier] AIR CANADA, an easy answer that strikes no chord in my quest to ferret out an obedience theme. And then, … KABOOM! It all hits at once when I see the reveal at 59a. Aha! It’s a cake rack! Other good stuff includes, but is not limited to, ENEMIES, THE SAME, PREDICTOR, BARE NAKED Ladies (juxtaposed with) STRONGMAN, KISS CAM, and I RAISE. Nice work, Jake! And kudos to David for accepting a puzzle others might have rejected on trivial, rule-related grounds. Overall, though, I didn’t love the puzzle. I really need some laughs to sustain me through a 21×21 grid, and when the theme doesn’t offer it, you’re faced with about 140 answers to just muddle through. It could’ve used some more fun clues. 19a. [Performer at a canine talent show in “Garfield: The Movie”], ODIE. All right, that is the freshest ODIE clue I’ve seen in years. Will N., did you watch the movie just to get a new clue? 50a. [Ermines, in the summer], STOATS. An old-school crosswordese mammal that somehow hasn’t gotten the ANOA treatment. 61a. [Father figure? ], DAD BOD. Cute clue. 66a. [What “T” may represent commercially], TESLA. There are people who can’t help seeing an IUD when they see the Tesla Motors emblem. 84a. [Artless nickname? ], STU. As in STUART – ART. Cuter than the other short name clue, 82a. [Peeples person?] for NIA. 92a. [Blogger’s code], HTML. I tried to fit OMERTA in there, but it wouldn’t work. 125a. [Home of the 2016 men’s and women’s Olympic marathon winners], KENYA. Last year’s men’s and women’s Boston Marathon winners were Japanese and American (and I don’t remember knowing that at all—I was more focused on the finishing times for my husband and his running buddies). Who will win Boston on Monday? Probably someone listed here. 17d. [In the club], INITIATED. Interesting clue since there are other senses of “in the club” that could have been intended. Fave fill: WINS BIG, ON POINT, IN A FUNK, SKOSH. Offset by lots of duller stuff. 3.25 stars from me, unless there is some other layer I’ve missed. Check out that nifty design! Theme is explained by the grid art itself. THEME: Things that spin (or appear to spin). 24A [Flourish on a bakery item] CUPCAKE SWIRL. 50A [Belt-driven cooler] RADIATOR FAN. 83A [Reason for sirens in Kansas] FUNNEL CLOUD. 107A [The Milky Way, for one] SPIRAL GALAXY. 3D [Wind farm revolver] TURBINE ROTOR. 60D [Relaxing soak site] WHIRLPOOL TUB. 8D [Toy that eventually falls] SPINNING TOP. 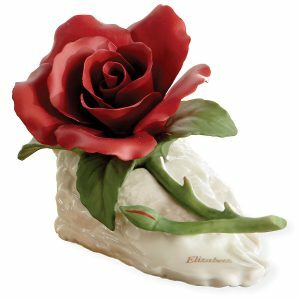 67D [Its petals are often red] ROSE BLOSSOM. Am I missing any? I feel like a may be. This isn’t the type of theme that depends on wordplay or a strict formula where everything must be exactly consistent. Rather, a set of themers that- in some sense or another- reflect the design created by the black squares. I had to check the symmetry in order to determine if some were/were not intended to be theme answers. For instance, a MUSIC BOX sort of conjures up an image of a spinning ballerina, but its symmetrical partner ARTERIES tells me that’s not meant to be considered. Just now I added SPINNING TOP to the list, which must be in the theme- and therefore ROSE BLOSSOM should be added as well. Looking at the image of a ROSE BLOSSOM, I’m surprised it didn’t hit me sooner. It felt like there was a lot of short fill due to the layout, but with 34 three letter entries, it’s on par with a typical 21x grid. They’re just a little more contained to certain areas of the grid. 40A [They may send medical records] FAXERS. Took me a while to see this… calling someone a FAXER seems weird to me. Though I think medical records are one of the few things that we still fax. 40D [December car topper] FIR. Had ?IR and was stumped. FIR as in a Christmas tree, of course. 57A [Ancient Greek historian] HERODOTUS. Needed all the crosses. 97D [Dress shirt pin] TIE TAC. Surprised this didn’t come with a “var.” qualifier in the clue. Googled in quotes, and I get “Did you mean: Tie tack” at the top of the page. 16D [Too curious (var.)] NOSEY. You can always forgive one (var.) in a 21x. Lots of great fill in the puzzle. STAR DATE, OIL GAUGE, PET PEEVE, SPACE JAM, SWIMS OFF, NO REASON, FOULED UP. How could you not say I LOVE IT! Take a well-known phrase, add an I, and the resulting wackiness makes a theme. 16d [Periodical for some Downton Abbey employees?] is MAID MAGAZINE (Mad magazine). 23a [Ryder Cup two-man team?] is a PAIR FOR THE COURSE (par for the course). 34a [Locally organized event with rides and games?] is a FAIR FROM HOME (far from home). 59d [Only bucket you’ll ever need?] is a LIFELONG PAIL (lifelong pal). 66a [Signpost signaling farmland?] is PLAINS AHEAD (plans ahead). 93a [Source of Capitol Hill water?] is a CONGRESS MAIN (Congressman). 112a [Overworked employee at a desert diner?] is a HOT RUNNING WAITER (hot running water). All the base phrases are solidly in the language. The altered versions are at least mildly amusing. A nice Sunday theme. 1a [Stationery item with printed margin lines] is a LEGAL PAD. Is there something specific about legal pads and margin lines? Notebook paper has margin lines, too. There are insects crawling all over this puzzle, with IMAGO at 17d and LARVAE at 86a. I hope no one has entomophobia. 44a [Copied, old-style] is DITTOED. I’ll ignore the roll-your-own construction because I am enjoying the memory of the somewhat intoxicating smell of fresh Ditto copies. Mmm. 42d [Visiting the Griffith Observatory, say] is IN LA. It’s the second time this week I’ve seen this entry. I didn’t like it the first time, either. 53a [Rhyme scheme in Frost’s “Stopping by Woods on a Snowy Evening”] is AABA. I suspect I’m not the only one who recited the first four lines in my head to figure this out. What I didn’t know before I did this puzzle: that the FDIC was founded in 1933. My AP American History teacher would be ashamed of me. This entry was posted in Daily Puzzles and tagged Evan Birnholz, Jake Halperin, Peter Koetters, Will Nediger. Bookmark the permalink. I disagree. In “rules are rules,” ARE follows the first “rules” and precedes the second one. You are correct, and I have gotten the necessary sleep. 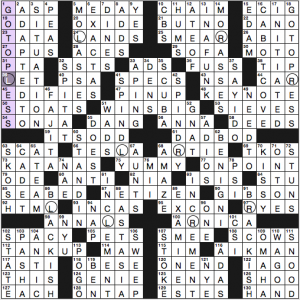 NYT has no other Ls or Rs in the grid except for the circled ones, which feels like an unnecessary constraint. Maybe that explains the 145 word count? The theme didn’t warrant going that high, in my opinion. OMG, who cares? “Hundreds of squares don’t contain either of these two letters” is … not entertaining. You asked if there was some layer you were missing; jj answered. It may not have added to the entertainment value of the puzzle, but it definitely fit the “okay, neat bit construction” motif that sometimes seems to earn a constructor style points around here. I agree Norm. Also, I am impressed that Will found five pairs of answers that fit the pattern so well. Really nice puzzle. I don’t award “style points” for crossword features that don’t enhance the solver’s entertainment. Universal (15×15) – 24D [Flawless recommendation feature?] ONEC. Not sure I get it. “One C” as in one carat? Universal 15x – The clue bothered me, too – I initially bought into the misdirect, thinking it referred to one C on an academic transcript – but on second thought, it probably means a flawless spelling of recommendation. Universal 21x – Wow, this was a great construction! The grid art, the many long examples, and the generally good fill made this solve a real pleasure. 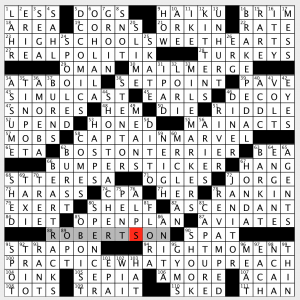 Universal 15x — note that “reccomendation” is misspelled thusly in the clue. So, to be “flawless” it needs one C instead. Clever clue. Universal 15x – Aha! Thanks for the responses, Paul C. and Norm. Working through those handful of theme letters on each side of the NYT, I kept think, that’s it? Seemed like way too little thematic payoff for a ton of awkward and obscure fill. Maybe if WE rather than the setter were required to make some kind of L/R switch it would have been more amusing. NYT: I liked it :). I guess I’m not a fan of puns, and Sundays sometimes feel like torture to me. This one played like a themeless for a while until you tumble to the theme. I like the grid design and the fact that the constructor went for something different. It felt like a well executed industrial loft design–stylish according to its own rules, but maybe not everyone’s cup of tea. In Judge Vic’s review, what does ILSA mean? It’s probably very obvious but it still eludes me. It’s my self-coined acronym for in-the-language stand-alone. It encompasses phrases, hyphenated words, and compound words. Been using it for 10+ years. If you like it, help me get it in the dictionary. I’m a big advocate of this term- perhaps we should hyperlink it to an explanation though as the same question comes up in comments often. Thank you both! 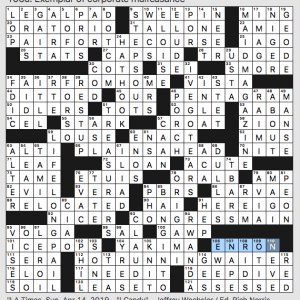 Maybe a small crossword glossary is warranted on the site. Looking back at today’s posts, I realize that I also don’t understand ANOA in Amy’s. I appreciate the shorthand. Ha! ANOA is not shorthand. It’s the old crosswordese Celebex ox. I’m not a big fan of “ILSA” since it’s not widely understood. “Natick” has gotten a lot more traction. Oy! ANOA sounds horrible. Thankfully phased out before I started solving in earnest. Natick? Too much I don’t know. I did not catch on until inclement/increment — at which point I went, “how interesting” and then “doh” + head slap. Great puzzle. The LAT had two additional aspects to its theme beyond “add an I.” Each I follows an A, and each time the addition changes the sound of the A from short to long A. It was a very nice Sunday. It may be dull but Sunday’s NYT had a lot more symmetry than anyone has commented upon. Note the center words from the bottom up: yummy’s YY, specs SS, pinup PP, netizen NN, etc. I count al least ten such pairs that aren’t themers. It may be a trivial feat, but as mentioned above, it has its own unique style. Washington Post, 65D: “Ones represented by three digits, at times”, is “agents”. Can someone explain this to me? Thanks! Secret agents like James Bond, represented as 007. Haha! I was thinking of real estate agents and talent agents, and wondering if their fees can be three digits (100% or more). Thank you very much Evan.